White Outdoor lawn mowers are one of the several brands manufactured by the MTD company. These mowers were made with price in mind. Despite the low cost, white Outdoor brand has features seen on more expensive brands, such as powerful Briggs and Stratton engines with spin on oil filters, and Hydo-Gear transmissions. 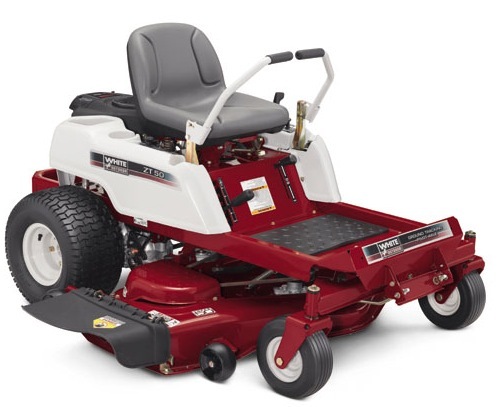 By keeping the price down, more consumers are able to afford the speed a ZTR mower provides. All the White Outdoor ZTR mowers allow for side discharge or mulch. The deck cutting height is adjusted manually using a lever. The decks are constructed of stamped steel, which is less durable than fabricated steel decks. The front axles on the entire line is pivoting fabricated steel. This is standard on most homeowner ZTR mowers. The frames on the White Outdoor mowers is stamped steel . A high back seat comes standard, with the most expensive model featuring arm rests. White Outdoor ZTR mowers come in 3 basic models, the ZT 42; the ZT 50; and the ZT 54. The model numbers refer to the deck cutting width. The ZT 42 comes equipped with the 18.5 HP single cylinder overhead valve ( OHV) engine. This engine features a pressurized oil system, with a replaceable oil filter. Drive wheels are powered by dual Hydro-Gear EZT transmissions. The lap bars controlling speed and direction are padded. All the White Outdoor mowers have an electric PTO to engage the cutting blades, which is activated by flipping a switch. The cutting deck is fabricated out of stamped steel. Adjusting the deck height is accomplished by a multi-position hand lever. List price is $2200.00. Model ZT 50 comes with a 50” triple blade cutting deck, and features the stronger twin cylinder Briggs and Stratton engine. The transmissions are again dual Hydro-Gear EZT. Padded dual lap bars and an electric PTO for blade engagement come at no extra cost. List price is $2800.00. Model ZT 54 has a 3 blade 54” cutting deck, with the husky 26HP engine to keep things moving. An engine that size deserves a strong transmission. The dual Hydro-Gear ZT-2800 drive units fill the bill nicely. The high backed seat has arm rests as a standard feature, as the only White Outdoor ZTR mower with this feature. Count on spending $3200.00. White Outdoor ZTR lawn mowers offer a low cost alternative to those residential customers looking for ZTR speed and efficiency. The engines and transmissions are solid quality. Some of the high end features seen on more expensive brands are missing.